This magnetic strip offers a beautiful blessing from 2 Peter 1:2, "Grace and peace be yours in abundance." Each magnetic strip is printed in full color and laminated, with a full magnetic backing. Use these magnets on white boards or metal surfaces like doors, desks, shelving or bins - any place a little inspiration is needed. 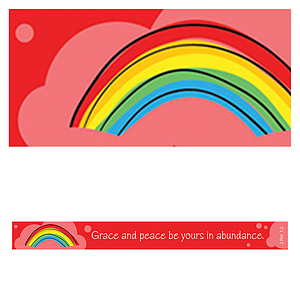 Grace and Peace: Magnetic Strip was published by Christian Art Gifts in January 2008 and is our 1424th best seller. The ISBN for Grace and Peace: Magnetic Strip is 6006937103214. Be the first to review Grace and Peace: Magnetic Strip! Got a question? No problem! Just click here to ask us about Grace and Peace: Magnetic Strip.